In a few years, you may never have to recharge your phone again. Today scientists announced the first viable "nanogenerator," a tiny computer chip that gets its power from body movements like snapping fingers or - eventually - your heartbeat. 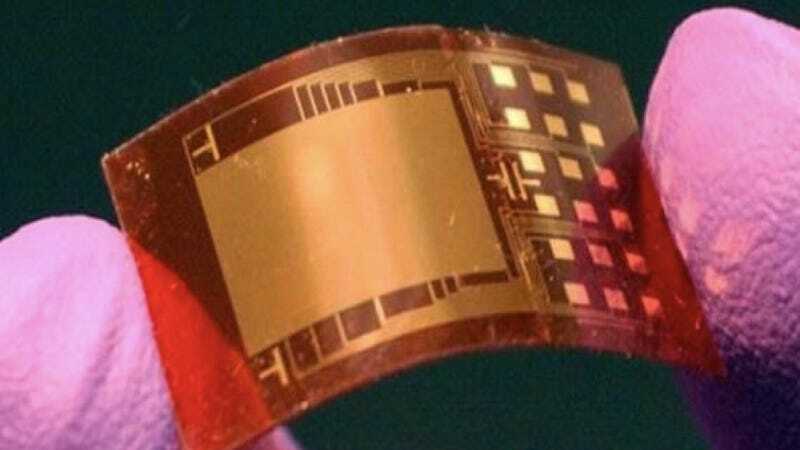 This technology, long anticipated by futurists, could replace batteries for small devices like MP3 players and mobile phones within a few years. For now, they can generate enough electricity to power a liquid crystal display and an LED. A group of researchers led by Georgia Tech's Zhong Lin Wang announced their groundbreaking discovery today at a meeting of the American Chemical Society in California. So how do these nanogenerators work, and when can you buy one? The generator itself is a flexible computer chip that you squeeze between your fingers. The chip converts the pressure into electrical energy, which it can store in capacitors and use to power LEDs. Over the past six years, Wang and his colleagues have boosted its power output by thousands times and its voltage by 150 times - and they think this is just the beginning. This development represents a milestone toward producing portable electronics that can be powered by body movements without the use of batteries or electrical outlets. Our nanogenerators are poised to change lives in the future. Their potential is only limited by one's imagination. If we can sustain the rate of improvement, the nanogenerator may find a broad range of other applications that require more power. He suggested its future uses would include "personal electronic devices powered by footsteps activating nanogenerators inside the sole of a shoe; implanted insulin pumps powered by a heart beat; and environmental sensors powered by nanogenerators flapping in the breeze." The key to the technology is zinc oxide (ZnO) nanowires. ZnO nanowires are piezoelectric - they can generate an electric current when strained or flexed. That movement can be virtually any body movement, such as walking, a heartbeat, or blood flowing through the body. The nanowires can also generate electricity in response to wind, rolling tires, or many other kinds of movement. The diameter of a ZnO nanowire is so small that 500 of the wires can fit inside the width of a single human hair. Wang's group found a way to capture and combine the electrical charges from millions of the nanoscale zinc oxide wires. They also developed an efficient way to deposit the nanowires onto flexible polymer chips, each about a quarter the size of a postage stamp. Five nanogenerators stacked together produce about 1 micro Ampere output current at 3 volts - about the same voltage generated by two regular AA batteries (about 1.5 volts each). Wang says the next step is to boost the nanogenerator's power output further, and find a manufacturer for them. He hopes to start by using them to power sensors, but believes that other uses will come quickly afterwards. You're going to see these tiny generators in stores within 5 years, he predicts. Get ready for the plugless, fossil-fuel-free future!